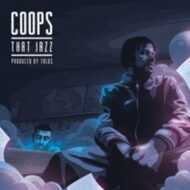 That Jazz' is Coops' first official offering since signing to High Focus Records back in October. By no means a debut, having already released two critically acclaimed albums ‘Lost Soul’ & 'God Complex' under his own steam in 2014 and 2016, the London MC is putting his best foot forward - a 'no nonsense' masterclass in smooth rhyming and soulful boom bap, produced by long time collaborator Talos. The beginning in a long line of releases planned for Coops this year, ‘That Jazz’ serves as the perfect introduction.